* Balcony with Beautiful view of Medellin. * Living Room with New Furniture and decoration. * Master bedroom with Queen Size Bed, night stands (2), Private bathroom. 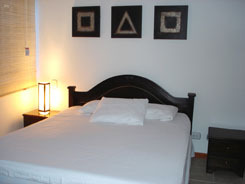 * Second bedroom with a brand new bed (1.90 mts x 1.60 mts) and 1 night stand. * Third bedroom with a single bed (1.90 mts x 1.20 mts) and 1 night stand. * Dining table for four. * Telephone to make Free local calls. * Free Calls to the USA and Canada (From our Office). * Kitchen with refrigerator, microwave, coffee maker and all Utensils. * Iron and ironing table. * Swimming Pool in Complex.